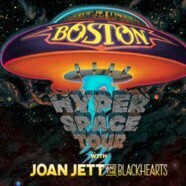 Music legends BOSTON continue their Hyper Space Tour this summer with the iconic JOAN JETT & THE BLACKHEARTS, for an additional 21 cities, presented by Live Nation. Performances with Joan Jett will begin on Wednesday, June 14 in Mountain View, CA at Shoreline Amphitheatre, and continue eastward across North America. More information can be found at livenation.com. Itinerary for the Live Nation portion of BOSTON’s Hyper Space Tour with Joan Jett below. Presale for BOSTON and Joan Jett & The Blackhearts fan club members begins Tuesday, March 7 at 10am local, through Thursday, March 9 at 10pm local time. General on-sale begins Friday, March 10 at LiveNation.com and on the Live Nation app. Always a huge crowd pleaser with their high-energy stage show, other-worldly sound, and exceptional musicianship, BOSTON prides itself on performing a totally live show, delivering an extraordinary experience that is faithful to their studio recordings. Unlike most bands at the time, all of BOSTON’s albums were conceived in a basement, written, produced and recorded by Tom Scholz, an MIT graduate who designed specialized equipment to capture the songs that he heard in his head. Scholz created his music with the intention of playing it live, in real time with real musicians, making it one of the few bands in history to reproduce seemingly-impossible-to-perform productions on stage, without the use of prerecorded music or technical enhancements. The timeless songs appeal to young and old alike, so it’s not surprising to see concert audiences that span generations. Fans can expect to hear the classic songs they have grown to love, and will be treated to wild Hammond organ work, soaring guitars, and exceptional vocal harmonies, and be treated to BOSTON’s unique visual stage presentation, from mind-blowing lightning bolts and spectacular lights to an interstellar “journey” from the cockpit of the BOSTON spaceship, along with plenty of extra-terrestrial sounds heard nowhere else on earth. It’s been over 40 years since BOSTON’s self-titled debut album first hit the airwaves and turned the world on to a new kind of sonic experience. With over 17 million copies sold, Boston generated hits such as “More Than a Feeling,” “Peace of Mind,” “Foreplay/Long Time,” and “Smokin’,” rock staples that are still in heavy rotation today. Their second album, Don’t Look Back was another chart-topper that confirmed their place in rock history, followed by Third Stage, which hit #1 on the charts, with the top single of 1986, “Amanda.” Walk On, Corporate America, and Life, Love & Hope complete the band’s discography. With over 31 million albums sold to date, BOSTON has stood the test of time. Scholz says, “I am thrilled to have Joan and her band on tour with us this summer. Not only is she an amazing rock and roll performing artist, but even more exciting to me is that she is a fellow vegetarian and shares compassion for animal welfare.” Both Scholz and 30-year BOSTON veteran Gary Pihl have been longtime vegetarians. Scholz has worked to promote that lifestyle as well as the prevention of cruelty and suffering to all living creatures. Continuing their effort to promote humane treatment for animals, one dollar from each ticket purchased this summer will be donated to Sea Shepherd Conservation Society, who are committed to ending the slaughter of wildlife in the world’s oceans, as well as Mercy for Animals, who utilize a broad range of strategic approaches that seek to expose cruelty, prosecute abusers, and inspire consumers to make compassionate food choices. Joan Jett is a true originator, an innovator, and a visionary. As the leader of the hard-rocking Blackhearts, with whom she has become a Rock and Roll Hall of Fame inductee, she’s had eight platinum and gold albums and nine Top 40 singles, including the classics “Bad Reputation,” “I Love Rock ‘N’ Roll,” “I Hate Myself For Loving You,” and “Crimson and Clover.” She sits at the head of her own independent label, Blackheart Records. Jett has acted in movies and television, including 1987’s Light Of Day, and in a Tony-nominated Broadway musical, The Rocky Horror Show. She has appeared on such acclaimed television shows as Oprah (the last season) and Law and Order. As a producer, she has overseen albums by Bikini Kill, Circus Lupus, as well as the Germs’ LA punk masterpiece, GI. Since co-founding The Runaways, the pioneering all-girl punk quintet at age 15, Jett’s determination and drive have kept her in the public eye. Jett was able to see her story told in The Runaways, the film based on (lead singer of The Runaways) Cherie Currie’s book Neon Angel starring Kristen Stewart as Jett, and Dakota Fanning as Currie. Jett was close to the project: She served as an executive producer. Jett & the Blackhearts released their last studio album, Unvarnished in 2013 and continue touring the globe to throngs of adoring fans.